If Satan plays miniature golf, this is his favorite hole. A ball struck at A, in any direction, will never find the hole at B — even if it bounces forever. The idea arose in the 1950s, when Ernst Straus wondered whether a room lined with mirrors would always be illuminated completely by a single match. Straus’ question went unanswered until 1995, when George Tokarsky found a 26-sided room with a “dark” spot; two years later D. Castro offered the 24-sided improvement above. 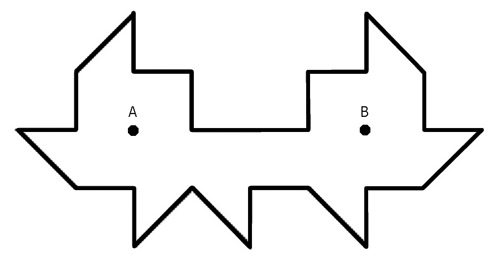 If a candle is placed at A, and you’re standing at B, you won’t see its reflection anywhere around you — even though you’re surrounded by mirrors.